Just Me And Fifty Moms... I'll Feel Right At Home! I'll be talking about parenthood and signing copies of my book Life Is Short, Laundry Is Eternal with the woman of Beth El. October 19th from 10am until noon. Stop by and say hello and then enjoy the best outdoor book festival that I've ever seen. Collingswood is a reader's dream come true! Join me on Saturday, October 11, 2014 when festival-goers will have an opportunity to stroll more than six blocks of Haddon Avenue filled with nationally recognized authors/speakers for adults and children, as well as booksellers, storytellers, poetry readings, workshops, exhibitors, kid-friendly activities, and entertainment for all ages. This award-winning festival is the longest-running, largest literary event in the Delaware Valley. I'm Going To Be A Guest On The April 9, 2014 Edition Of 'Leiberman Live'! "Leiberman Live” on Sirius XM Howard 101 is a daily news show on the Howard Stern channels. Jon Leiberman is a seasoned journalist who appears on the Howard Stern show and on television shows regularly discussing the news issues of the day. This 15 minute show couples expert opinions with the opinions of those from the Howard Stern world. The end result is a mixture of information and entertainment sure to inform and entertain. Catch it all day on Howard 101! I'll be speaking Wednesday night at the Barnes & Noble, Princeton Market fair. Stop by and hear the story of my path to being published, the writing process and a bunch of inappropriate stories I bet BN doesn't think that I'll tell. Join Scott on July 18 for a live discussion about blogging, type I diabetes advocacy and his new book, 'Life Is Short, Laundry Is Eternal: Confessions of a Stay-At-Home Dad'. I'll be on Katie Couric's talk show, 'Katie" this Wednesday, June 19. It's a syndicated show so it runs at a few different times of day. 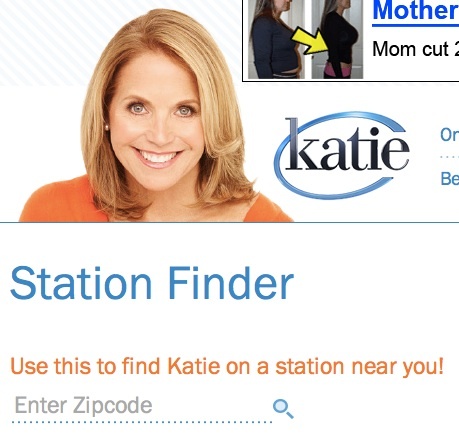 Use Katie's station finder to find the station and time near you. After we taped the interview last week Katie asked me if I would also contribute to her blog! I've sent the piece to her digital producer and I'll link to it as soon as it posts. This has been an exciting few weeks and Katie has been so very nice, I actually have a message on our home answering machine from her TV producer that says that she is sorry for calling and asking me to appear last minute (As if I cared!) but that, "Katie asked for me personally" during their production meeting. The next day, I was on her stage - I had the audience laughing a few times during the segment that I was a part of, hopefully it all won't be edited out. I can't wait to find out! We are away right now on a family vacation so you may well see the episode before I do - let me know what you think.